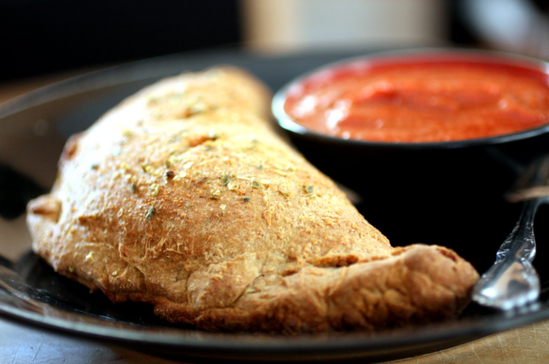 Our calzones use fresh ingredients and are folded into our ciabatta style dough and then baked to a golden brown…You’ll dream of these in your sleep! Please allow a few extra minutes for our calzones - they’re worth the wait! Sausage, pepperoni, mushrooms, green and black olives, extra cheese, pizza sauce. Taco meat, onions, black olives, tomatoes, sour cream, and taco sauce. Topped with crushed taco shells, lettuce and cheese. Extra taco sauce and sour cream served on the side. Grilled chicken breast, ham, mushrooms, cheese and homemade Alfredo sauce, folded into an unforgettable calzone. Mushrooms, onions, green peppers, green/ black olives, tomatoes, cheese, pizza sauce. Tender roast beef, onions, green peppers, Italian seasonings, and delicious mozzarella, folded into one of our famous calzones. Served with our pizza sauce and Parmesan dressing on the side.